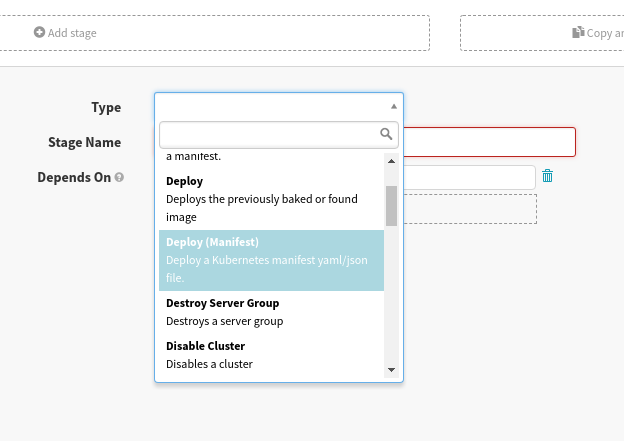 This guide shows the basics of how to deploy a Kubernetes manifest using the Kubernetes Provider V2. Don’t select the regular Deploy stage; it deploys more opinionated “Server Groups” using another provider (including Kubernetes V1). Notice that by selecting Text as the Manifest Source, we get to enter the manifest YAML by hand. 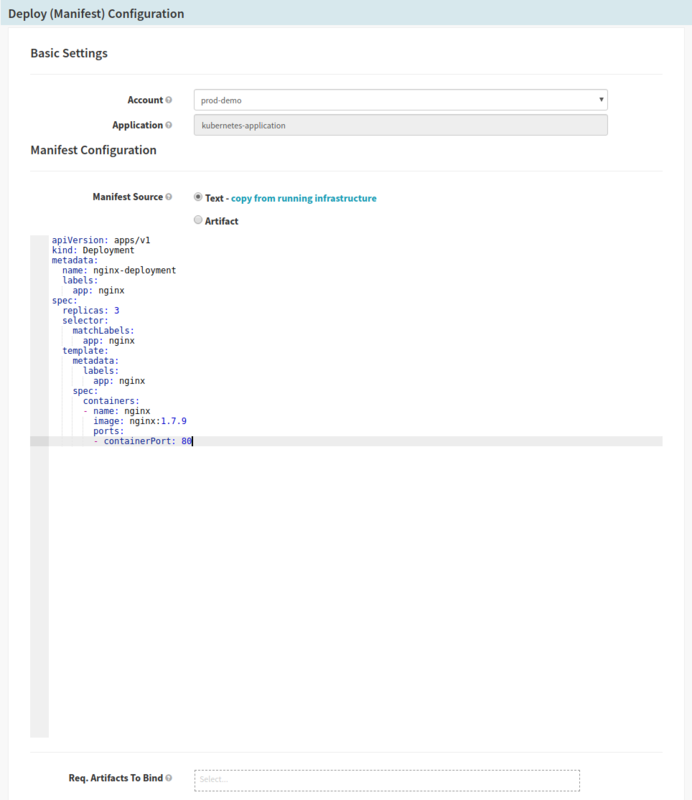 If you are storing your manifests outside of Spinnaker’s pipeline repository, or want a single deploy stage to deploy a variety of manifests, you can specify your manifest using an Artifact. The idea is: artifacts in Spinnaker allow you to reference remote, deployable resources. When referencing an artifact from a Deploy Manifest stage , that artifact must be a text file containing the Manifest specification. This can be stored in GitHub or an object store (like GCS). Notice that by selecting Artifact as the Manifest Source, we get to pick which upstream artifact to deploy. ☞ Note: Make sure that the Artifact Account field matches an account with permission to download the manifest. Keep in mind that the artifact bound in the upstream stage can match multiple incoming artifacts. If instead we had configured it to listen to changes using a regex matching . *\.yml, it would bind any YAML file that changes in your artifact source, and deploy it when it reaches your Deploy stage. When one of these objects exists in the pipeline context from an upstream stage, Spinnaker automatically tries to inject it into the manifest you’re deploying. Keep in mind that even if you don’t specify an artifact as required, it can still be bound in the manifest. This is just to ensure that all artifacts you expect will be bound.